Tissue Cultured Hops Plants — Pioneer Plant-Tech, Inc.
Tissue culture, or micropropagation, is the only truly reliable method for the large scale production of healthy, clean, disease and virus-free hops plants. This page provides information about our process of propagating clean, disease-free hops for sale in New York, the Northeast, Ontario, Quebec, and other Canadian provinces. We employ an advanced tissue culture process to grow large quantities of uniform offspring from a single 'mother' hops plant. Our process begins with certified clean stock plants obtained from the National Clean Plant Network, which we routinely test through independent laboratories. Shoot tips are harvested from these carefully moderated stock plants under the contamination protection provided by laminar flow hoods. These 'explants' are then distributed into sterile containers filled with our proprietary growth medium and arranged in our grow room, a state of the art facility where temperature, light intensity, and photo period are regulated electronically. There, the explants quickly begin to generate additional shoots. Every two to four weeks the multiplied explant clumps are divided and transferred to new growth media. The number of plants increases geometrically with each transfer. The last transfer, when the desired number of plants is reached, occurs on a rooting medium to produce roots. After rooting, the plantlets are transferred to cell packs, which are then moved to the climate-controlled, insect-exclusion environment of our grow-on greenhouse for 4-6 weeks, where they are grown further and acclimated for sale for outdoor planting. From start to finish, the process of producing saleable plants ranges from 12-16 weeks, depending on the variety of hops. Why Is This Different From Standard Techniques? 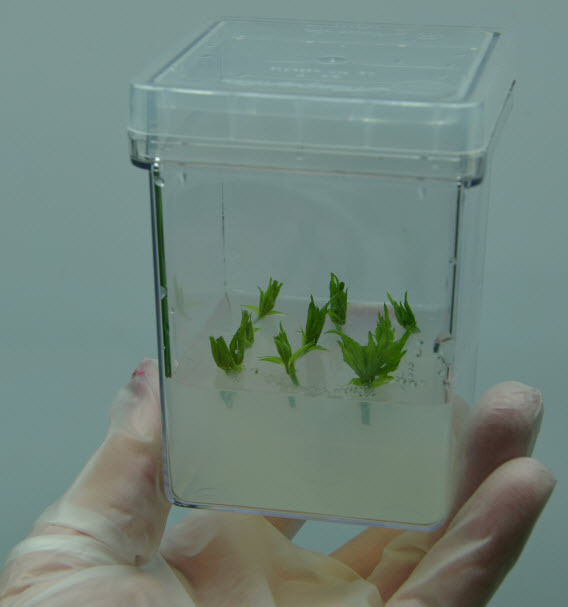 There are many methods of propagating baby hops plants, but tissue culture in a controlled, sterile environment like ours is the only process which can provide large quantities of disease-free second generation descendants of the stock plants on demand. Historically, most new yards were planted with rhizomes or cuttings from plants in existing yards. This can work, but it carries significant risk, as any virus, viroid, or other pathogen from the existing plants are then replicated in the new location. Many commercial greenhouse facilities now offer hops plants for sale as well, and some even began their efforts with cuttings from the National Clean Plant Network in a good-faith effort to avoid the sale of diseased products. This was a significant step forward for the industry. However, once plants have left the care of the National Clean Plant Network, there is no guarantee that they will stay clean. Where did you obtain your stock plants? If the answer isn't "The National Clean Plant Network" or some other verifiably reliable source of disease-free material (such as our company or one of the several hops tissue culture labs in the Western U.S.), you'll probably wish to look elsewhere. Are your sale plants second generation? Second generation plants are those that are propagated with tissue excised from the original 'mother' plants. Oftentimes growers will obtain their 'mother' plants from a clean source, but then in subsequent seasons grow new batches of plants for sale via cuttings taken from offspring of those mother plants. With each such generational separation, there's additional opportunity for the appearance of disease as well as mutation. Always seek second generation plants. How do you ensure that your plants stay disease-free? Ideally, hops will be grown in hops-only facilities, with careful protocols to prevent contamination. Unfortunately, in most cases, hops are only one of many varieties of plants offered by large commercial greenhouses. They are commingled with other plants, propagated using the same tools and hands that handle other species, overwintered with bulbs extracted from outdoor soil, and exposed to anything passing in the breeze. These are fertile grounds for ensuring that even plants that initially started clean soon encounter disease. At the end of the day, it's your hop yard, and you must evaluate what level of risk you are willing to bear at time of planting. We aim only to ensure that you have the knowledge available to make the best decision for you. Want to learn more? Give us a call, or contact your local university extension hops expert.